Flatwoods Park is the largest and most diverse LHWP tract on the GFBWT, and it’s also the most visited. One of the park’s prominent features is a paved, multi-use, 7-mile loop trail (with four rest shelters, water stations and paved connecting trails) that is popular with cyclists, skaters and runners. 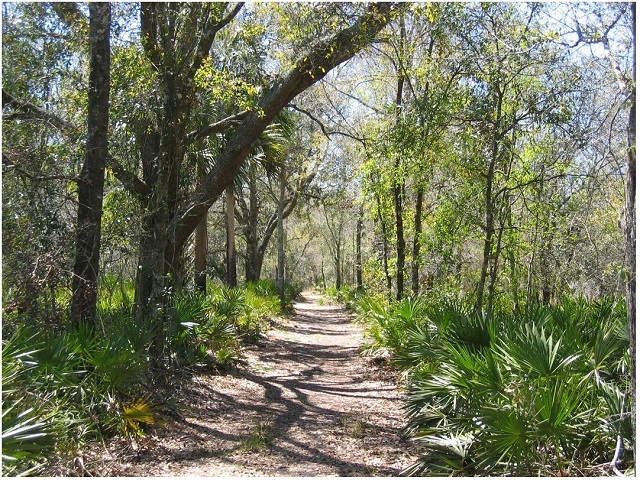 This loop trail, and miles of unpaved trails, wind through flatwoods, past cypress domes and seasonal wetlands good for Wood Stork, Sandhill Crane and Wood Duck. The pines harbor Wild Turkey, Northern Bobwhite, Brown-headed Nuthatch, Eastern Towhee and Bachman’s Sparrow. Watch for American Kestrel, Chipping Sparrow, Eastern Phoebe and Blue-headed Vireo in winter. Up to 25 species of wood-warbler have been spotted during fall migration, including Golden-winged, Chestnut-sided and Blackburnian. A bike makes it much easier to cover this property, but remember to mind the other cyclists and trail users. Visitors can take the Wilderness Park Off-Road Trail System to nearby Trout Creek Park or Morris Bridge Park if desired. However, you can easily spend countless hours exploring the numerous trails in this park’s interior.